And now, for the answer to the second instalment of the Guess That Trashcan series. 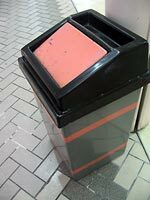 The trashed trashcan was on the island between Lot 10 Plaza and Sungei Wang Plaza. You’d see it if you crossed the road on Bukit Bintang Road. I’m beginning to wonder if you have an affixation with trashcans, but hey it’s good to be observant. cyber-red gets a close second place for guessing one half of it, “Lot 10“. Titoki gets 1/10th for guessing the other half – “Sg wang“, but she also threw in 4 other guesses, so we divide that half-right guess by five, and 1/10th accuracy gets you no pimpin’ link. Sorry. Oh, and here’s Part 3. P.S. I hope this series will subconsciously make Malaysians remember to throw their trash in trashcans. This entry was posted in Pictures on May 28, 2006 by 2konbla. Haha !! I was just guessing actually 😛 And yeah !! that’s subang parade’s bin 🙂 but im late ! haha !! Tina: Hahaha yah wei… Long time no see wei!!! Those tiles are as old as me..
hahaha, i love the trash can trilogy… such a unique post! i was so gonna guess subang parade except that everyone else got here first. do subang natives get brownie points for guessing?? but there’s also one(exactly) near my house…so how do you explain that? subang parade. i don’t think there’s other malls with tiles like theirs. subang parade renovated the inside meh?? hmm best place in the whole of parade is swensens.. the days spent there after exams in collage for the immediate healing/pre-partying session was the bomb! subang parade very nostalgic la. ish..
uncle hoong! what happened to going to friendster cafe ar?? must go when I get back this time arrrr!!! I went there just last week, and yes, they were renovating, but these trashcans and tiles were still around. I remember Toys R Us being downstairs, and those funky glass tube elevators. M.Y. you uh… get a free hug! Matthew: Take a picture to prove you have another one exactly like that near your house. I don’t know where you live.